Wednesday June 6th 2018, night two at the Bell Centre, Montreal. Show 15 and final Canadian show for U2eiTour. A welcome return for All Because Of You, replacing Gloria in spot 5 on the setlist. It's last outing was back at the LA Forum in May. Here's the set list. @MarieAllisonRoy Thank you to all four members of @U2 and crew for the best night of my life. This is a memory no one can take away from me. Best band of all time. 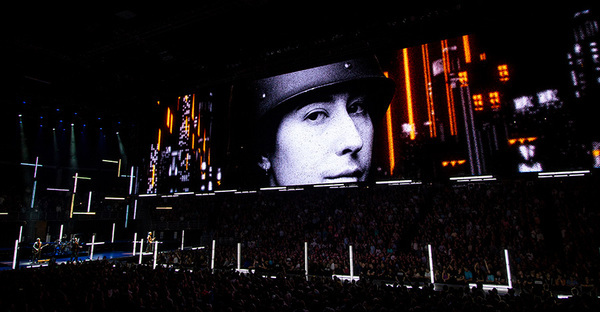 @RRoxtar What an emotional and wonderful night at U2 eXPERIENCE + iNNOCENCE tour. Meeting Bono and The Edge was a bonus. There is a Light indeed. Do you know your heart has it's own mind? Has to be the adventures of our very own zootopia moderators just ahead of the show today. We had heard that 4 past & present zoomods were in town and were meeting up in 'real life' for the very first time in Montreal. By way of thanks for all they do for us here at U2.com & right across the U2 community, we invited them to explore that rarely-seen place known as the 'underworld' that exists below the #U2eiTour stage. Dallas, Stuart, Terry and Sam really made them feel at home… Check out the Gallery they have started over in the Zoo (and are adding to) to see what went on. Its pretty special (@maxtsukino @mich40u2 @u2baja & @_bigwave_ all on twitter and collectively under the @u2comzoomods twitter banner for more). 'Leonard Cohen right in front of you.' (during Beautiful Day).